Folic Acid IP 0.5 mg + Vit. B12 7.5 mcg + Sorbitol Sol (70%) IP q.s. Transports oxygen to the tissues (Haemoglobin) & helps in cellular oxidation mechanism. Prevents folate deficiency & megaloblastic anemia. 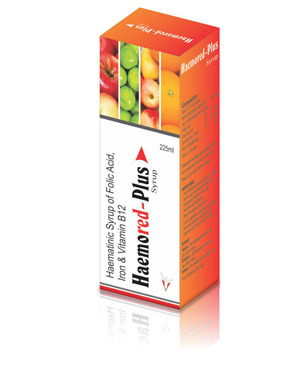 Stimulates for normal hematopoesis has beneficial effect on liver function and on nervous system.